Gecko Toes hose hanger, originally uploaded by espeedy123. 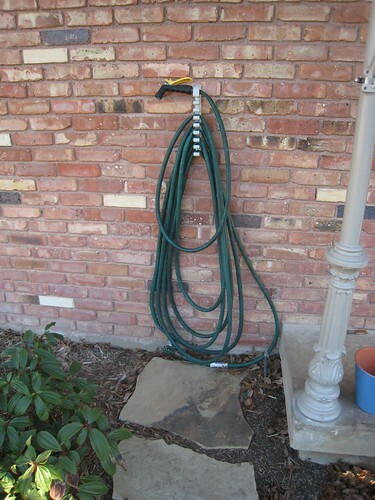 One part of my front landscape project is to establish a better way to store the hose. I started with a hose pot. It was nice-looking but difficult to use. So small it almost disappears. Hose reels tend to be big and ugly. This one is just the opposite. Unfortunately my hose doesn’t disappear, so maybe in the spring I’ll hunt for a rust colored hose. Easy to unreel just what you need. By grabbing the end and walking away, just what you need comes off the device. Easy to re-reel the hose. Cheap! At $11 it beats any hose pot or reel. I ordered mine online but if you visit the link above you might find a store near you that sells it. To attach it I used lead expansion anchors in the mortar between the bricks. I used a masonry bit on the holes and then used epoxy to glue the anchors into the holes. It took me a long time and a couple frustrating visits to Home Depot to get the hardware on this right. Fortunately, these anchors seem really secure. Smarter, tougher projects than BHG, less complicated than Woodworker, totally tailored to the modern handy person! I love it. Any real DIYer uses these so much she could probably use another better-fitting, nicer-looking pair. Used by professional furniture delivery guys, this furniture repair kit would also work for those craigslist fixer-uppers! Love it. Your sweetie will never have to run to the paint store for chips again. I have not yet tried this but if it works as advertised it would be AWESOME. It hammers at 35 strikes/second. I don’t do a ton of hammering, but when I do I find it difficult, and I find it hard to do a good job of it. I own one of these and it is AWESOME. So much easier to operate than the old metal clunker type. Totally worth the money if you are caulking joints for painting, it will save your hands. Eager to hear what everyone else wants, please comment! Door Before Weather Stripping, originally uploaded by espeedy123. The main takeaway for me was about a door weatherstrip category called “jamb up.” It was the consensus suggestion for old problem doors that don’t have a built-in groove for vinyl weatherstripping. “Jamb up” stripping is made of a rigid metal, composite, or wood frame with an attached rubber gasket. 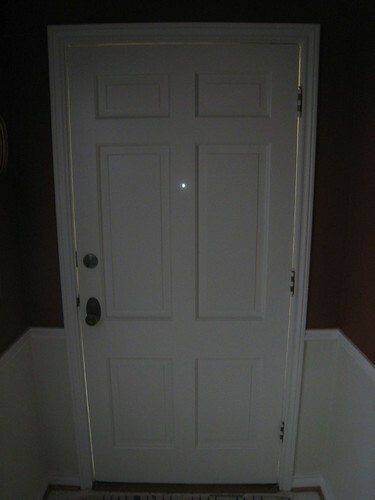 It is installed on the outside of the door around the jamb and butts up against the door when it closes. It fills large uneven cracks, and if you can find the wood type, it can be painted to match the door and blend in with everything else. Not as invisible as the strips on new doors, but better than sticky foam.